As we visit with friends and family, the question is always — what to drink besides the same old same old. When the seasons change so does the grape. Wine styles change according to tastes of the wine reviewers. Bordeaux, for example, is usually now made to be drunk at a younger age, requiring less cellaring. Cabernets have grown more concentrated and higher in alcohol. Chianti has dropped the practice of blending in white grapes in favor of cabernet blends. So goes the world of wine. But for many trends there are countertrends, or perhaps just holdouts. Wines, that is, that remain true to their roots. I call them wines from ancient vines, still grown in their original terroir, and made according to tradition. Most older vines require extra care and the yields are often low, but there is always a logic to why such vines continue to thrive in their locations. You’d expect such wines to be on the expensive side, especially with the prestige that artisanal products currently enjoy in the food world, but that’s not the case. Most of these lesser known grapes and regions remain affordable. California zinfandel is a good example. Often started in phylloxera-resistant soils, they have lasted for generations even in regions of the state not noted for fine wines. Zinfandel has had its ups and downs since it was planted in California in the 1850s, and by the mid-twentieth century was all but forgotten. Consumer tastes have evolved to where red zinfandel has a cult following and wineries like Cline and Ravenswood and several from the Mendocino Ridge area consistently produce lovely zins from old vines. Expect to pay under $20 for a great deal on an interesting, flavorful bottle. The dolcetto grape is grown in the Langhe region of northwestern Italy. Most of those we see come from the Alba area, hence the label designation, Dolcetta d’Alba. Much more of an everyday wine than its more aristocratic Piedmont compatriots, nebbiolo and barbera, dolcetta is grown much the same way it has been for generations. The taste is earthy, rounded, lively, with a touch of well-balanced bitterness. You should be able to find excellent Dolcetta d’Alba for less than $20, priced far below a typical Barolo. Gruner veltliner is not the easiest name for English speakers to pronounce. But it is well worth the effort. The grape is primarily grown in a dramatically beautiful area of terraced hillsides along the Danube a bit west of Vienna. Stone walls retain the heat of the sun and provide an ideal environment for grapes to properly mature, even if they make harvesting a more difficult task. But it makes one of the most refreshing white wines to be found anywhere. Young gruner veltliner is a bright, fresh wine with citrus tones and bell pepper notes, and strong mineral underpinnings—and one of the best white wine bargains you’ll find. Bubbles in your red wine? Yes, really. I’m talking about Lambrusco in the twenty-first century. It’s emerged from the shame of what was done to it in the 1970s and 80s, now with us as a dry, fruity, lightly effervescent, exuberant red that can be pure pleasure for less than $20. Such wines have a deep tradition in Italy, where Lambrusco is produced in four areas around Emilia-Romagna. It is a buoyant, original and unpredictable choice for pastas, cheeses and many other foods, with the potential to be much more appreciated slightly chilled here in Palm Beach. Unlike the grapes mentioned so far, Gewurztraminer is grown in many regions of the wine-producing world. It is generally considered to reach its peak, however, in the French region of Alsace. Traminer is a family of grapes and the name very appropriately means spice or perfumed traminer. That’s a succinct summary of this wine. Its most characteristic aroma is lychee, along with rose petals, peaches, honeysuckle and floral tones. Many salty, spicy or smoked foods, including Asian or Indian dishes difficult to pair with most wines, are a great balanced match for Gewurztraminer. 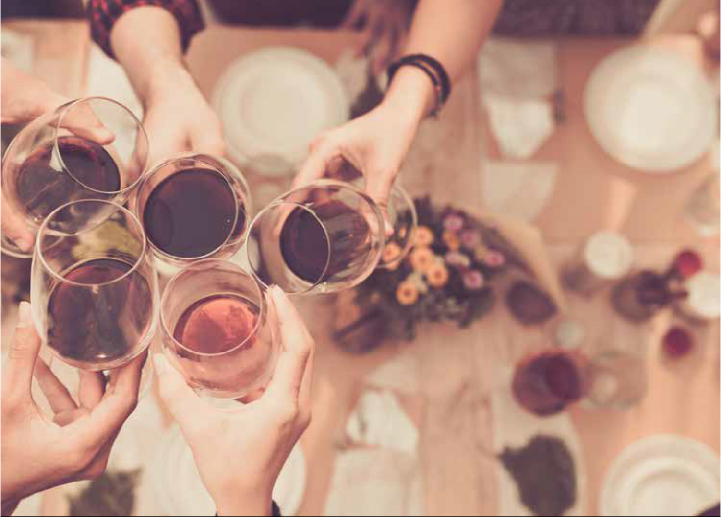 Look for these and other often overlooked wines like vinho verde from Portugal, pinotage from South Africa, French Fleurie, Spanish garnacha, German kerners—wines where grapes and regions tell the story. There is an endless variety of wines true to their roots. Be adventurous and you will never run out of choices and pleasures.